My brother in law is going to be turning 60 this year… he is an advid fisher man. Every chance he gets he is out at the lake. So what would suit him better for a gift than a Fishing lap quilt. 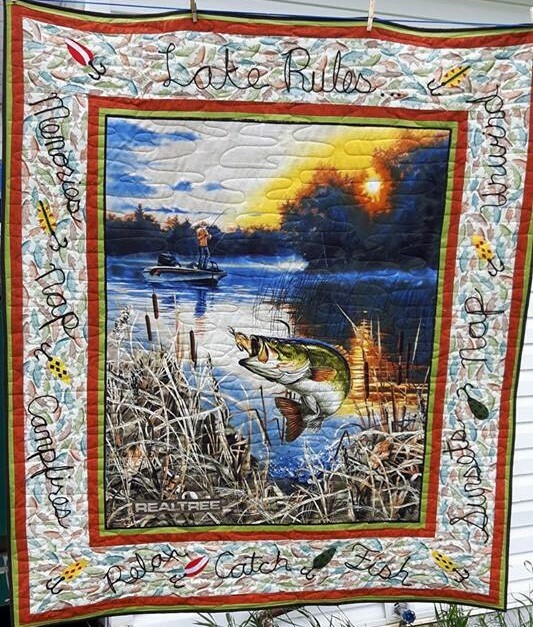 Two weekends ago I went to the Edmonton Quilt show and the vendor from Cold Lake Alberta had this perfect fishing panel. Since I don’t have much time to make a fully pieced quilt I figured a panel would be the quickest to make in to a lap size quilt without too much work. So off to my EQ program. I absolutely love this program it sure makes my life easier when designing the quilts I make. The 1st try on adding borders to the panel did not sit well with me so I just kept on playing till I got something that I liked. I will be swap out the spoons for lures that my brother in law uses if his son sends me pictures. ok I’m not happy with that at all so I went in search of a green to pull out the fish. I like the rust to pull the sunset but I am not keen on the brown. Back to the design program to play with colors and sizes. That’s much better. Time to start sewing the strips together. Green, Rust, Fish, Rust, Green and Brown for binding(save for later) since I had cut it already. All done.. now just to add the appliqued garnishes. To this stage it wert real fast I only took 2 hours to complete the borders on this panel. I’m pretty sure the Applique will take way longer. Now that my borders are all finished, I decided to use my Couching/Braiding foot to couch the letters in script . This is done by stringing a piece of yarn or ribbon though the foot. and sewing it on using the zig zag stich. The words I chose for this quilt was header, Lake rules… Memories, Nap, Campfires, Relax, Catch, Fish, Sunsets, Quad, and Unwind. My nephew sent me some of the hooks that my brother in-law favours so Ill sit down with pen and paper and do these up. Here are the pictures he sent me. Ill be palcing these in the corners and between the words. After moving the lettering so that it was all centered I choose to only do the spoons on the quilt to keep it consistent. I doubled up 5 hooks to fill in the ten spaces. Now that I have all the lures appliqued onto the top Its time to sandwich and quilt. I’m right on time with this project and will have it finished by my set date. Here’s the pic of the top before quilting. After playing with paper and pen I came to a Free motion quilting motif in my opinion will suit this quilt. It is ment resembles ripples on the lake. Here is the final finished quilted and bound quilt. Next I’m now the proud owner of a HQ Sixteen.